Here we are on the Oregon coast and it’s snowing. It’s not supposed to do that here, but it is. Not much is sticking but enough so you can see it. We let out the dogs this morning and they went nuts; they are not used to snow and they love it. They were chasing each other around the yard like maniacs. The Beagle (Logger) was chasing his buddie (Freddie Bear) one of our Labs and the Lab had to slow down so Logger could catch up. They were barking their heads off having a great time and rolling in the snow. I love to watch them when they are chasing each other around in the back, we have a couple of acres that you can see in the back. I can watch them go crazy all around the backyard. The other dogs we have (two more Labs) all get involved and it’s really fun to watch. Fortunately we live in an area that doesn’t get very cold and snows very seldom and we can get in the car and go for thirty minutes and get into the snow when we want to. My faux son Austin lives in Alaska and it gets down to twenty below some of the time and one of my other sons, Seth, is also up in Alaska where he fishes for a living so we get to hear all about mucho cold weather all of the time, that’s close enough for me. I used to not mind the cold weather, but unless I am hunting or doing something that keeps me moving or jumping around I just don’t like it much. Nowadays I get to wear my parka and long-johns to keep warm. We just got back from the Archery Trade Association Show in Indiana and the weather was about 12 or 13 degrees as an average low temp, with highs up to the low 20’s. Back in Myrtle Point, while the temps are so low, we moved the cat and dog beds into the house. It’s a thrill during feeding time with the barking and meowing not to mention us trying to get some chow in our faces, but it’s fun. It was fun at the ATA show, we got to show off our new products. The carbon arrows Rose City Archery is selling really caught a few peoples eyes. Of all of the new products we’ve introduced I like the footed shafts best, it’s really an opportunity to show off the talent we have working here. Our craftsman’s main objective is to put more weight forward in the arrow, this provides more energy in the shaft for more “killing power”. It’s amazing to see how much more force is imparted in the arrow when you add that extra weight in the front part of the arrow. Of course there are other ways to put some extra weight forward but they aren’t near as efficient as the footed arrow. Plus they look great and fly super true so if you have some talent with the bow you can have more efficient and better arrow flight; actually footed shafts will make a better archer out of the person behind the bow. We also have the Lumenoks that we are able to attach to a wood arrow; what this does is the nock end of the arrow lights up when you shoot the arrow so that you can tract the flight of your arrow and see where your point of impact is with the shot you just made. If you are hunting you are able to see where the point of impact is and where that arrow strikes the animal. You’re able to track the animal by this light, it is something that makes you more efficient in recovering an animal after you have made the shot. I believe this is a wonderful innovation in the archery world helping with the recovery of an animal. Especially if you are tracking that animal after dark, battery life is good for forty hours so you have a decent period of time after the shot to recover the animal. Rose City Archery is producing what we call “Carbon Footed aka Fusions” where we attach a carbon extension to the wood shaft, this allows the archer to be able to use any of the screw in attachments that are available to carbon arrow shooters. This includes all of the different broadheads and other points that won’t fit on wood arrows. Another new product we have re-introduced is RCA tapered shafts. This allows the archer to use an 11/32 or 23/64 shaft and be able to use a 5/16 nock, which a lot of folks think they have better control of the arrow with the taper and the smaller nock. New for 2017 is our extra long shafts, archers who have that 32” plus draw length found it difficult to find wood shafts long enough for their draw, we have provided the solution. We have what you need and we want to make your archery experience better. We have more new stuff coming soon so keep your eyes on this Blog and the newsletter for updates. This entry was posted in archery artwork, Arrow Making, Arrow Shafts, Arrows, Bear Archery, decoy, decoy hunting, Jerry Dishion, Traditional Archery and tagged arrows, carbon arrows, footed shafts, longbow, lumenok, Port Orford Cedar, recurve, traditional archery, wood arrows on February 8, 2017 by rosecityarchery. We took this photo to represent a reflection of the overall hunting experience…because it’s about the journey that led us here, to this very spot in the wild. This may be the successes, the frustrations; the countless hours of scouting, studying, practicing, planning; the rhythmic lapping of river water against a Coleman canoe; the pre-dawn, headlamp-guided walks into your deer stand; the light wind current and thermals causing your breath vapors to rise and drift as you exhale into the frost-bitten air; the welcome sounds of the woods and sweet absence of man-made chatter; the sudden rush of a mature, commanding whitetail buck confidently coming into your calls or your rattling horns; the silent time when your mind wanders and you contemplate your life and how your living it, judging yourself; when thoughts of your loved ones and truest friends are interrupted by a rutting buck that offers a perfect broadside bowshot that will aid in a clean ethical kill; the decision to pass or deliberately take the shot; your selfless buddies that help you without gripe or question; the comfort in knowing that your supportive family understands why you hunt and the satisfaction of knowing that same family will be eating protein-rich backstraps that The Lord provided…but only after the work is done. All those grand experiences that lead to the collective moment when you realize that it’s not about me, and you lower your head in humility and thankfulness. Then your smile grows big and you take some more photos with a deer that you honor, respect, and are proud to have harvested. Ode to the hunt. This entry was posted in Arrows, Bear Archery, Luke Strommen, Port Orford Cedar Arrows, Rose City Arrow Styles, Traditional Archery, Traditional Archery Hunting, Traditional Bow Hunting and tagged archery, archery hunting, arrows, Bear, bow hunting, bowhunting, cedar arrows, Fancies, fancy arrows, Luke Strommen, recurve, rose city archery, traditional archery, traditional archery hunting, wood arrows on January 18, 2016 by rosecityarchery. This is a short video showing a way to install a bow quiver on a Bear Archery Kodiak takedown recurve bow. Now, I know that mounting a quiver on a bow is pretty basic, but you will find some helpful tips in the video such as a way to protect your bow’s finish from being scratched or marred by the quiver (after all, your new Bear bow is really an investment, isn’t it?) and what type of screws to use if you have to go out and buy some. It would have been nice to use thumb screws or winged screws to easily take off or put back the quiver if you prefer a separated quiver when you shoot or hunt, but I couldn’t find any locally. I prefer a well attached bow quiver most of the time so I didn’t mind using the screws I used. In this particular video, I really revived an old friend…a vintage Bear Archery 4-arrow bow quiver. I failed to narrate this in the video, but I bought the quiver on an online auction site. They are great quivers that can offer many more years of use, but be ready to replace the rubber arrow holders on the quiver as it can be brittle and break due to its age. Replacement rubber can be found for these quivers. Rose City archery also sells the excellent Thunderhorn bow quivers. They are easier to install (simply slide them on your bow’s limb) well designed, and will provide years of service. [shopify product=http://www.rosecityarchery.com/products/thunderhorn-boa-quivers]. And if you liked my Bear Kodiak, Rose City Archery can hook you up with one or any of the other models of Bear bows. This entry was posted in archery artwork, Bear Archery, Port Orford Cedar Arrows, Traditional Archery, Traditional Archery Hunting, Traditional Bow Hunting and tagged bear archery, Bear Arrows, Bear Bows, bow hunting, bow quiver, bowhunting, bows, cedar arrows, Luke Strommen, recurve, rose city archery, traditional archery, traditional archery hunting on August 8, 2015 by rosecityarchery. 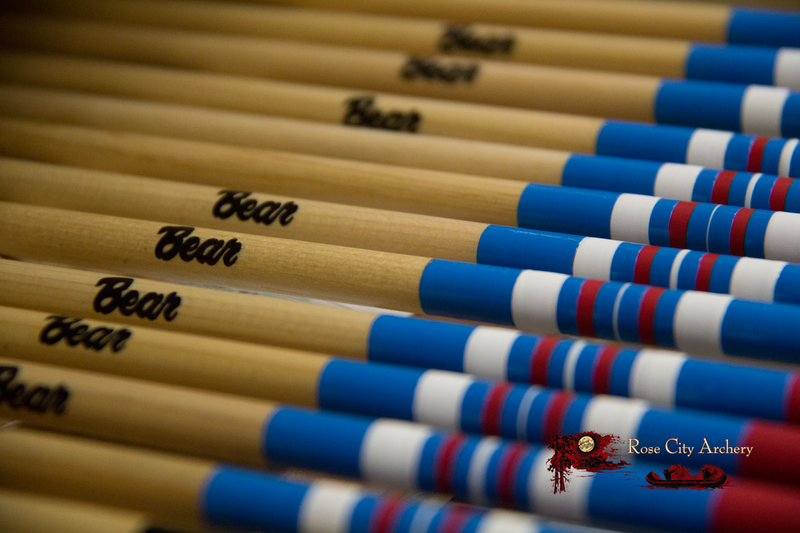 Ever Bear Arrow that leaves the factory is stamped with the classic “Bear” signature. These arrows are our throw back retro arrows to represent the “hayday” or prominence of traditional archery. These beauties stopped being mass produced with the advancement of technology in the archery world. We decided to bring them back to life for the traditional archery enthusiast who loves Bear’s longbow/recurve line up and wants a matching set of “Bear Arrows” to shoot. If you own a Bear bow you’ll be tickled to death with these new, or should we say “old”, retro Bear Arrows. There is three different types of bear arrows, X400, X 300, and the X200. This entry was posted in archery artwork, Arrow Making, Arrow Shafts, Arrows, Arrows Archive, Featured, Jerry Dishion and tagged archery hunting, arrows, bear archery, Bear Bows, bear shafts, bowhunting, bows, longbow, recurve, target shooting, traditional archery, ts on September 7, 2014 by rosecityarchery. This entry was posted in archery artwork, Arrows, Arrows Archive, Jerry Dishion, Rose City Arrow Styles, Rose City Webisodes, Traditional Archery, Traditional Archery Hunting, Traditional Bow Hunting and tagged archery hunting, arrows, ATA show, bear archery, Bear Arrows, bow hunting, cedar arrows, recurve, rose city archery, traditional archery hunting, wood arrows on August 28, 2014 by rosecityarchery. Here is the sped up version of our videos series “how to make and arrow”, in this video there is tips and tricks to help you build an arrow from scratch. Don’t blink there is valuable arrow crafting information in the text that accompanies this videos. For more information check out Rose City Archery’s longer version of “How to Make an Arrow” with Jerry Dishion, this extended version goes into much more depth of the arrow making process. This entry was posted in archery artwork, Arrows, Arrows Archive, Jerry Dishion, Port Orford Cedar Arrows, Rose City Arrow Styles, Traditional Archery and tagged archery, archery hunting, arrow making, bow hunting, crafting arrows, home made arrows, how to make an arrow, how to make arrows, making arrows, recurve, traditional archery, traditional archery hunting on August 14, 2014 by rosecityarchery.